PROVISION of medical facilities is a key focus in the early stages of The Salvation Army’s disaster response in Central Sulawesi, Indonesia, in the aftermath of the devastating earthquakes and tsunami. At the time of writing, 1,193 people are confirmed dead, and thousands have been injured, with the figures expected to rise. A priority is to repair The Salvation Army’s quake-damaged Woodward Hospital in Palu and to restore full functionality – including operating theatres – as soon as possible. Currently, patients are being cared for in the open and under makeshift tents. The main government hospital in the city has collapsed, increasing the importance of the work that can be carried out at Woodward Hospital, which suffered only relatively minor damage. Outreach teams of Salvation Army healthcare professionals are being deployed to more remote areas outside Palu in order to provide much-needed medical assistance. The teams include students from The Salvation Army’s nurses training school, who have been supporting doctors and nurses. Because of severe damage to road surfaces, access is only possible by motorcycle or on foot. Access to fuel is also extremely limited. Salvation Army personnel in Palu met on Monday to coordinate the distribution of food throughout the city, which had been commenced by Palu 1 Corps (church) as soon as it was able to recommission its kitchen. Food and drinking water supplies remain scarce. The emergency response and logistics are being coordinated by Lieut-Colonel Yusak Tampai, who travelled to Palu by military plane along with his niece, who is a doctor. Sunday worship went ahead for many Salvationists on Sulawesi, including in the open air because buildings were damaged. Commissioner Peter Walker (Territorial Commander, Indonesia) shares that 'Salvationists in the area continued ... to seek God's hand even in these extreme situations.' Eight Salvationists are known to have lost their lives in the disaster, but contact has still not been made with people in some more remote areas. The commissioner is grateful for the prayers and messages of support that have arrived from Salvationists and friends worldwide. Knowing this support is there has, he says, been a source of great encouragement for people linked with The Salvation Army in Indonesia. 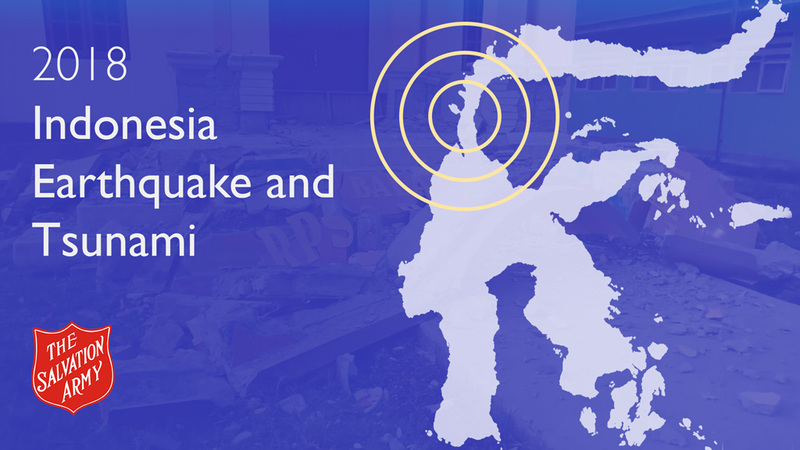 Seven of Palu's power stations were knocked out by the earthquake and transmission cables have been disrupted across the region. This, combined with further infrastructure damage, has led to hundreds of mobile telephone cell towers being disabled. The Salvation Army is overcoming some of the communications difficulties through the establishment of a communications centre using volunteers to convey important messages around the city by motorbike. The sharing of accurate information is important because rumours that there is a worse disaster to come are causing great fear among an already shocked population. The Salvation Army is working closely with other agencies and the local authorities in order to deploy resources wisely and with maximum benefit. The national government has now declared a 14-day state of emergency. Donors wishing to support The Salvation Army’s South Pacific and East Asia Disaster Fund can do so securely online.